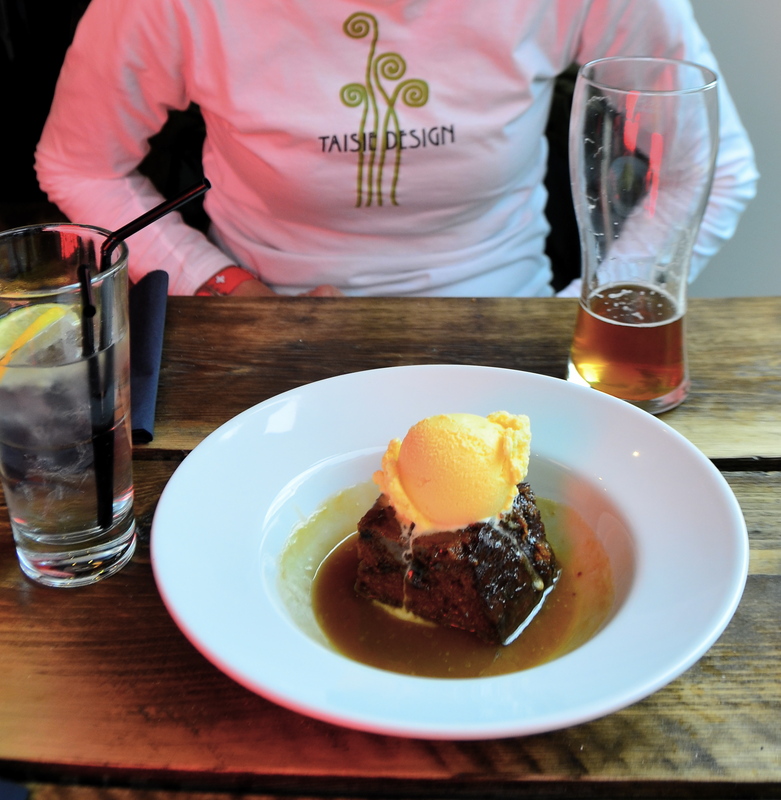 For some people thirteen is a very unlucky number, but while traveling and eating our way around Scotland in search of the best Sticky Toffee Pudding, my husband and I fortunately found out that thirteen was our lucky number. Sticky Toffee Pudding is a moist, buttery sweet cake made with chopped dates, smothered with warm toffee sauce and served with custard or vanilla ice cream. Yummy! 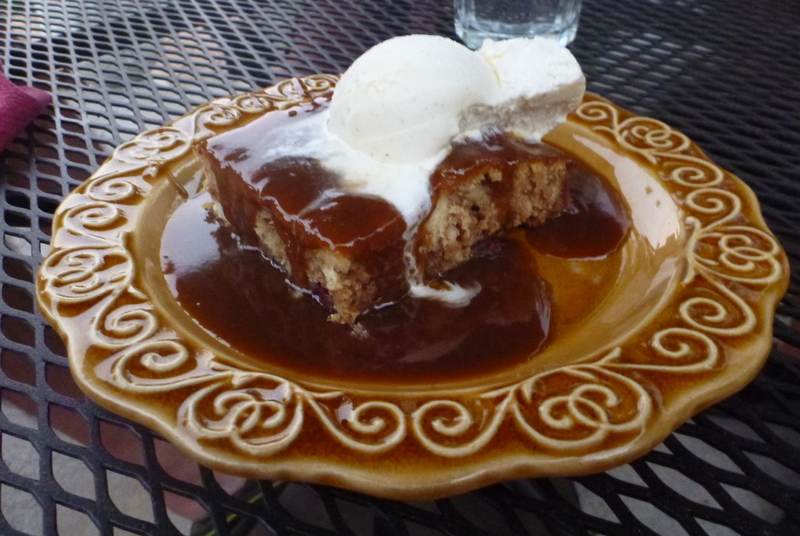 My introduction to Sticky Toffee Pudding was a few years ago while visiting a remote part of northern Ireland and staying at McGrory’s of Culdaff. The hotel restaurant was out of our usual first choice for dessert to share: chocolate cake. Even though Sticky Toffee Pudding is very popular in the United Kingdom and Ireland, we’d never heard of it and both of us were unexcited to try it. I was especially turned off since I usually don’t like desserts with dried fruit since I still had visions of bad fruitcake from Christmases past. After that first taste of Sticky Toffee Pudding, we were amazed by its deliciousness, and we fought over the last bite. Ever since eating that first Sticky Toffee Pudding at McGrory’s, I’ve been obsessed with finding it on menus here in the United States but it’s been difficult if not possible. 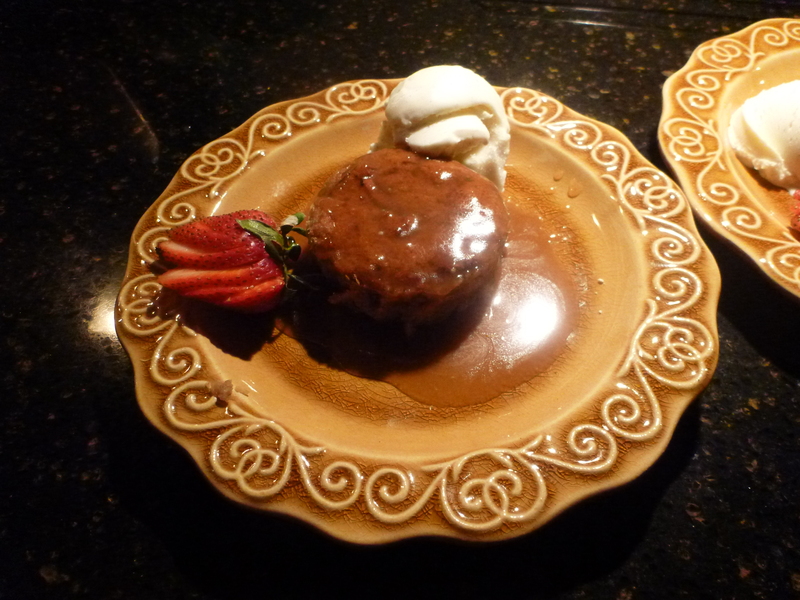 Resorting to the Internet, I found a Sticky Toffee Pudding recipe on CHOW that turned out pretty good and almost brought me back to that delightful day in Ireland. 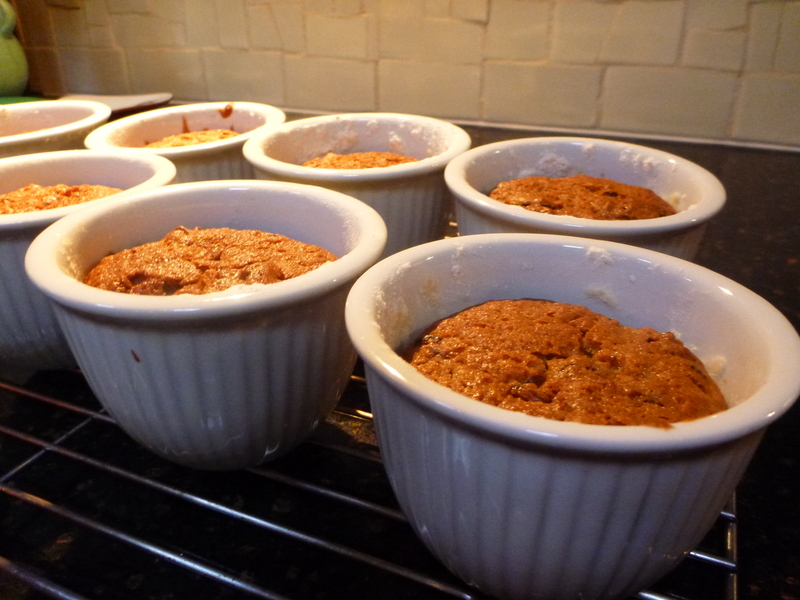 While planning and thinking about our trip over to Scotland, I was looking forward to seeking out and finding as many Sticky Toffee Puddings as possible. All of the following reviews are totally subjective and suited to my taste buds. Arriving in Glasgow for our first evening in Scotland, we headed down to Molly Malone’s Irish Bar which was just down the street from the Pipers Tryst Hotel at the National Piping Center where my husband had been taking Highland Bagpipe lessons earlier in the day. Bob ordered his usual Haggis. Fish and Chips for me, and then the anxiously awaited Sticky Toffee Pudding to share. The toffee sauce was good on the pudding at Molly Malone’s but the cake wasn’t very sweet or moist and lacked sufficient dates. It was okay but not as wonderful and delicious as I’d remembered from McGrory’s. This was the first Sticky Toffee Pudding of the trip. Maybe my expectations were too high or it was because we ordered it with custard. Although tasty, I’d prefer having it with vanilla ice cream. 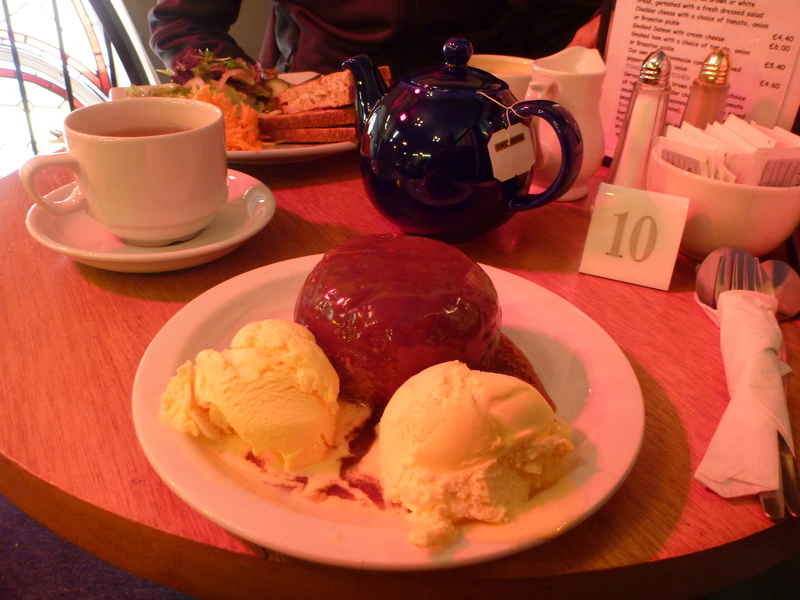 The Willow Tea Rooms on Sauchiehall Street was the second place in Glasgow we tried Sticky Toffee Pudding. My main goal was to see the inside of this famous Charles Rennie MacKintosh designed interior but we decided to have lunch and try their version of Sticky Toffee Pudding while we were there. 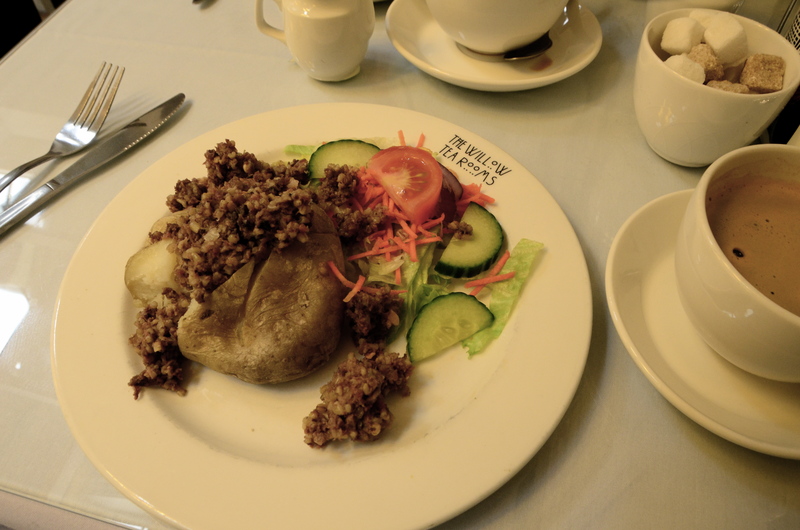 For some reason, we didn’t take a picture of the pudding but we did get a shot of the interior of one of the Willow Tea Rooms and my husband’s Haggis on a baked potato. I can’t even remember anything about that particular Sticky Toffee Pudding, perhaps because it wasn’t very memorable. 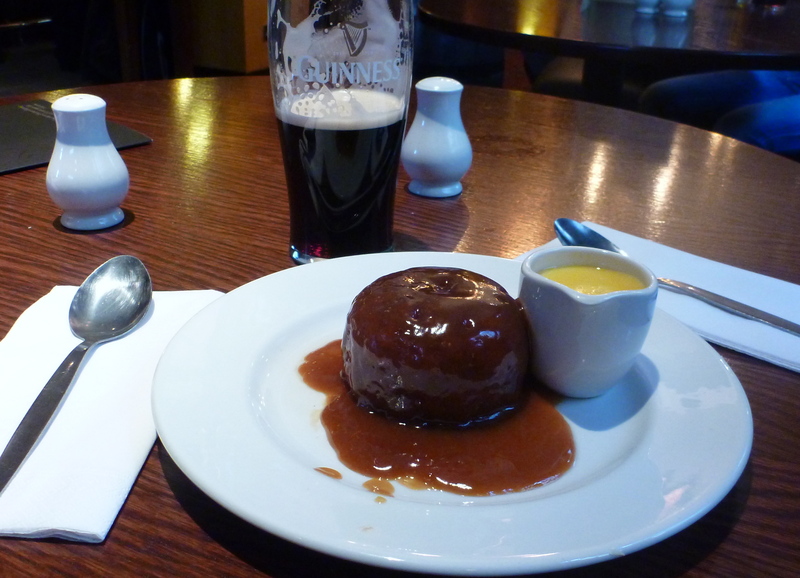 The third pudding was at The Atholl Arms, also located near the National Piping Center. The Atholl Arms is your typical Scottish pub with dark woods and the warm and cozy low key atmosphere that we love. We had great service, dinner and a good but not excellent pudding. When we were at the bar paying for our dinner one of the other patrons, a local that had been drinking pints at the bar all evening overhead us talking to the bartender. Realizing we had American accents, he jumped out of the chair and gave me a tight hug! He said that he has friends that live in Miami and Toronto and loves Americans. Nothing like a big bear hug by a drunk Scot to take your breath away! Afraid of what might happen next, we quickly left. 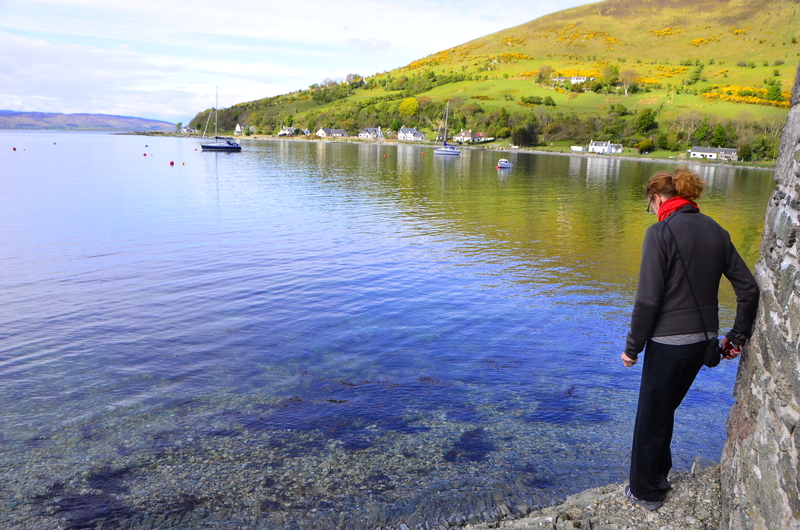 We left Glasgow for a short drive to the ferry and across the Firth of Clyde to the Isle of Arran and the tiny picturesque port village of Lochranza. We met up with my husband’s dad Jim and his wife Susan also there on vacation and to give a poetry reading along with other poets from Arran. Number four pudding was at the Lochranza Hotel pub just a few doors down from our lovely B&B at Castlekirk. After a decent dinner, we ordered one big Sticky Toffee Pudding for dessert with four forks. This was Jim and Susan’s introduction to it and they liked it. Even though I thought it was more quantity over quality, I’d definitely go back there to eat dinner and try the pudding again. Onto pudding number five at the Ninth Wave Restaurant in Fionnphort on the Isle of Mull. Exhausted and hungry after spending all day visiting Iona, we’d been looking forward to eating at this highly rated restaurant. 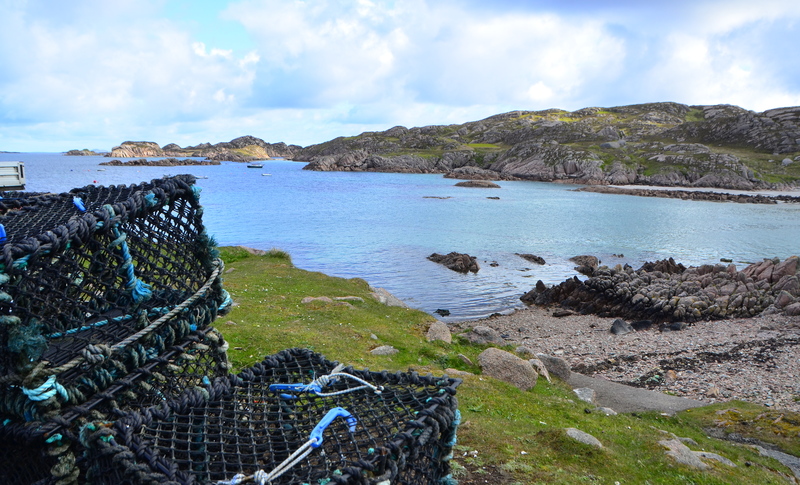 Meals were served in four courses by the very friendly fisherman by day and kilt-wearing owner by night. We all ordered the Scottish Duo dessert which consisted of an Iced Drambuie Parfait with a mini Sticky Toffee Pudding and Vanilla Pod Caramel and Praline. I didn’t get a picture of this pudding either since I was trying to be sensitive about whipping out the camera at every meal like a lot of foodies do even though there’s no written rule on the proper etiquette for doing this. The Ninth Wave’s pudding was moist, full of flavor but not enough bites for me to thoroughly enjoy and get a sense of its taste. The wee size made me want to beg for more but we were trying to stick to our food budget. This one was now in first place. Sticky Toffee Pudding stop, Number six, was at Cuan Mor restaurant in the bustling touristy port town of Oban. Arriving to the restaurant soaking wet after a horrific rain and wind storm we sat down to dry off. The restaurant was trying to be a trendy hotspot for the tourists but we politely asked them to turn down the music so we could carry on a conversation without yelling. The food was decent and the four of us shared a pudding. The pudding here didn’t get high marks for presentation although it was about a six in taste on my Sticky Toffee pudding scale of 1-10. Saying our sad goodbyes to Jim and Susan in Oban, they headed back to England and we headed up the Great Glen to the village of Fort Augustus, situated along the shores of Loch Ness. Pudding number seven was at The Boatside Lochside Restaurant. The Sticky Toffee Pudding was lacking adequate toffee sauce but I’ll give them marks for their attempt with some sort of presentation. The cake itself was very chewy from being apparently over-heated up in the microwave. It was served with a miniscule amount of custard. This one was at the bottom of the taste test, although the setting was right up there. Sticky Toffee Puddings number eight, ten and twelve were actually eaten at the same place, The Castle Tavern in Inverness. We went there three times but not because it was so close to our wonderful B&B, The Ardconnel House, but because of the great food, comfortable atmosphere and service. The pudding was very good and consistent all three times. We even turned some other Americans from Seattle seated next to us on one of the nights onto Sticky Toffee Pudding since they’d never heard of it. Number nine pudding was at Number 27 restaurant near Inverness Castle and again a very short walk from our B&B, which was welcomed after Scotland’s unseasonably cold and chilly weather. Our dinner was fine but I didn’t care for the pudding at Number 27. In fact, I couldn’t finish eating it. Number eleven Sticky Toffee Pudding at the Leaky’s Bookshop and Cafe. This second-hand bookstore in Inverness is supposed to be the best in this part of Scotland. I loved looking through the hundreds of old books and prints before heading upstairs to the cafe. The friendly lunch service and pudding at Leaky’s was good and it sported the right amount of toffee sauce for us, and included two scoops of French vanilla ice cream! Our last Sticky Toffee Pudding, number thirteen, was back in Glasgow. 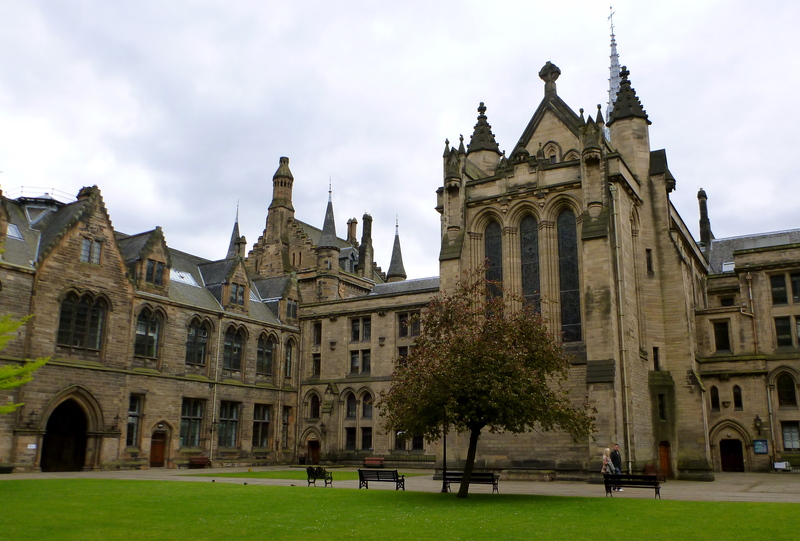 Knowing we would be sitting on a cramped plane back to Idaho for most of the following day, we went for a long walk around the gorgeous Glasgow University campus. We stopped into Bruadar near the university for dinner and for their Sticky Toffee Pudding. It ended up being our favorite because it had just the right texture and flavor in the cake, the toffee sauce in my opinion was perfect! So between the Haggis Burger that my husband loved and that pudding it was a nice ending to another incredible visit to Scotland. Sticky Toffee Pudding, Number Thirteen, the best! 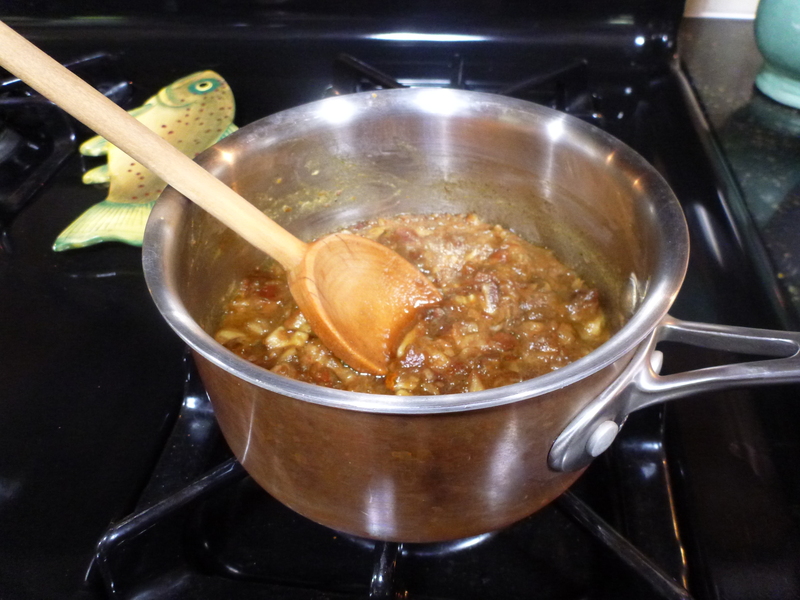 Back in Idaho while working on this blog and researching the history of Sticky Toffee Pudding to find some links, I discovered a couple of things. First, the origins of Sticky Toffee Pudding are debatable and a mystery. The Sharrow Bay County House Hotel in the Lake District of the United Kingdom claims to invented it but so does the Undy Arms Hotel in Aberdeenshire, Scotland. I like to think that it was invented in Aberdeenshire since that’s were a lot of my Scottish ancestors came from. I found the Undy Arms Sticky Toffee Pudding recipe on the Internet. It was easy to make, I liked it and so did my neighbors from up the street. Sadly, the second thing that I also discovered while researching for this blog was that Bruadar Restaurant in Glasgow was out of business for some reason. 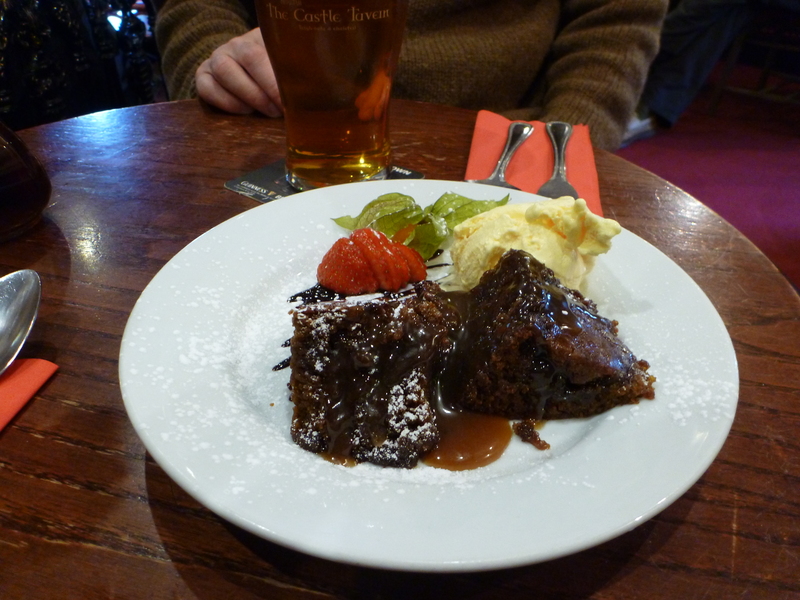 The next trip to Scotland, unless Bruadar re-opens, I’ll have to return to the Ninth Wave Restaurant for number two favorite or start a new quest for the best Sticky Toffee Pudding in Scotland. Homemade for now will have to do. Delighted to read about your tour and discovery of one of our national delights. (Found this page via Beggs bagpipes newsletter!). Next time, try cranachan. Far better than STP and healthier (well, not when I make it). If you haven’t got a recipe for this pleasure I can send you one by Nick Nairn – reknowned Scottish chef. Note that Leakey’s bookshop actually claims to be the biggest 2nd-hand bookshop in Scotland according to the back of their menus. As you say, a great place to browse – particularly if you’re tall enough to reach the upper shelves! Glad you enjoyed your holiday – nice photos too. 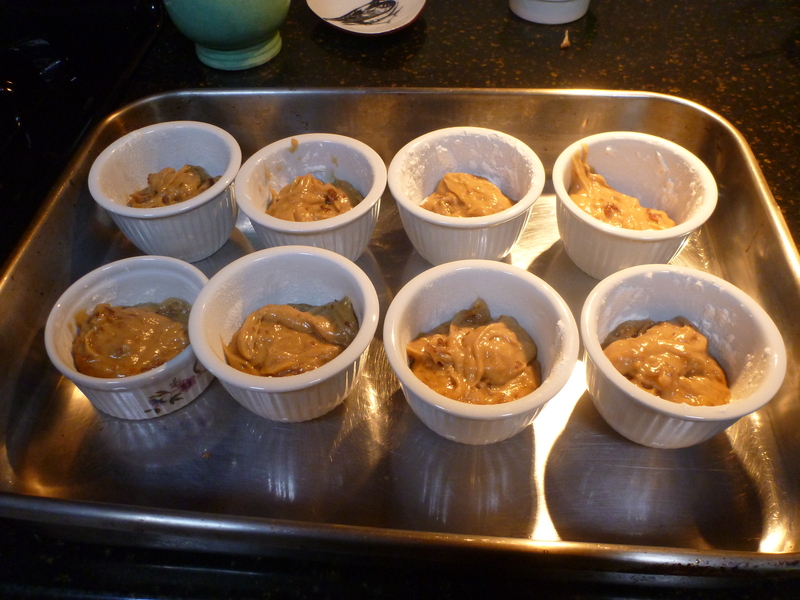 Anyway, I think a little less oil and a mixture of flours is an improvement to the original. The icing makes the cake complete. This in no way can compete with Scotland trips and out to dinner adventures! However, I think this recipe was the answer to a question about what could match a dessert I had on Haight St, SF at a place called Dish in the early 1990’s with John Brotzman. 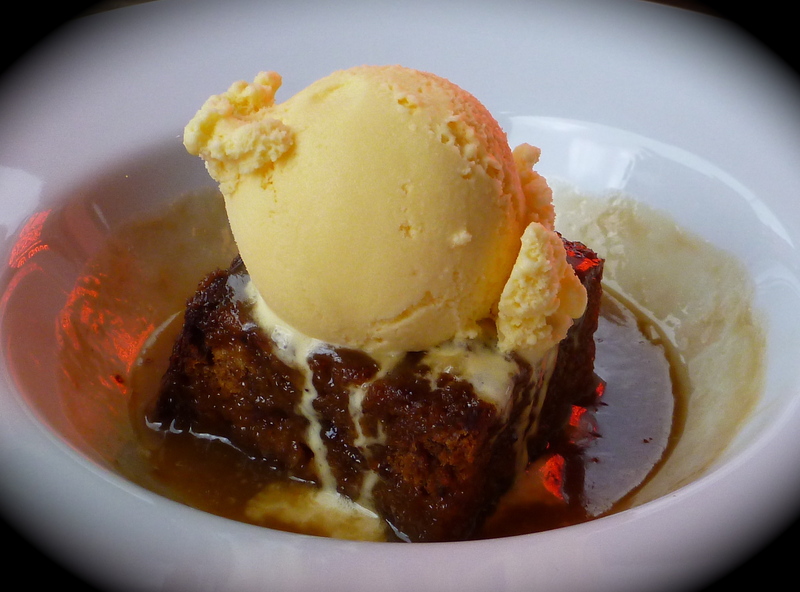 Try the Inn on the Loch for fantastic sticky toffee pudding. Its the best I have ever tasted in a restaurant and I am an experienced cook and have extremely high expectations of my puddings…it’s a scottish thing. Enjoyed this very much……but you have to remember, just because you had a Great STP at a restaurant one time does not mean it will be great the next time……chefs come and go and we all know that’s the deciding factor in how the pudding turns out…. Jeannie, Thanks for reading and commenting. You are absolutely right on consistency, happens all time time with every restaurant because of turnover with staff, chefs, and recipes get sometimes get modified. I have yet to find STP any restaurant in the United States that I’ve been a customer, I hope to return to Scotland one of these days and have it for dessert after every dinner…again! 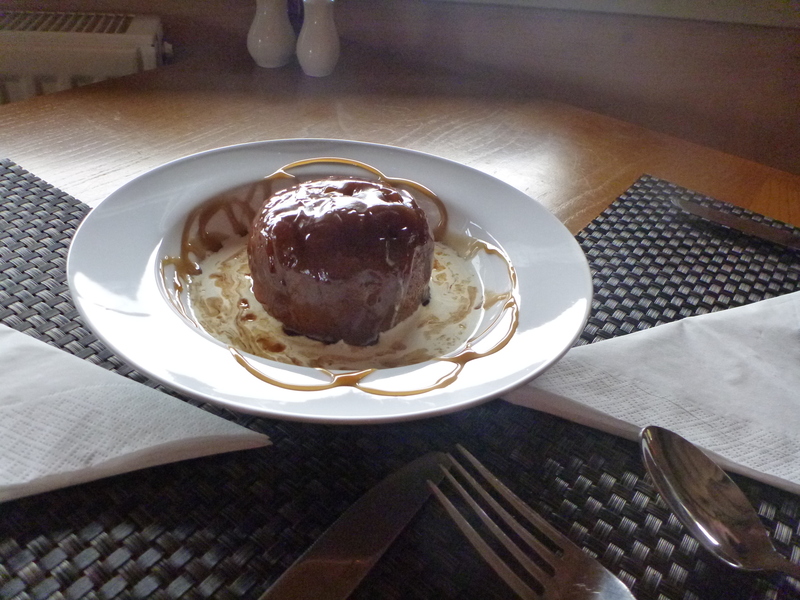 My wife and I first discovered the joys of Sticky Toffee Pudding at the Hootenanny Restaurant in Inverness, Scotland. Our 2015 visit was so memorable that we included it on our “must return” list when we revisited Scotland in 2017. The second trip included our 18 year old granddaughter. Her estimation of their version of Sticky Toffee Pudding: “I think I’m having a religious experience.” We can find no better words of praise.